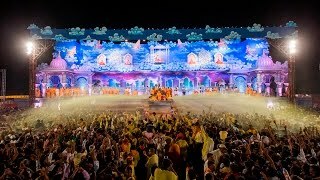 Over 70,000 devotees and well-wishers from throughout India, USA, Canada, UK, Tanzania, Kenya, Uganda, Bahrain, UAE, Australia, New Zealand, Indonesia and many other countries gathered in Sarangpur for the first grand Fuldol celebration in the presence of Pragat Brahmaswarup Mahant Swami Maharaj after the passing away to Akshardham of Brahmaswarup Pramukh Swami Maharaj last year. The beautifully decorated stage captured the attention of all. The stage background depicted the heavenly scene of Bhagwan Swaminarayan and Aksharbrahman Gunatitanand Swami, seated on an adorned hindolo, together with Brahmaswarup Bhagatji Maharaj, Brahmaswarup Shastriji Maharaj, Brahmaswarup Yogiji Maharaj and Brahmaswarup Pramukh Swami Maharaj, blessing the village of Sarangpur from their thrones in Akshardham. At the center of the stage was Pragat Brahmaswarup Mahant Swami Maharaj, with sadguru saints and dignitaries seated on both sides. The assembly, based on the theme ‘Ej Range, Ej Sange’ (‘The same color, the same association’), revealed that Bhagwan Swaminarayan remains present in the Satsang through the Gunatit Satpurush. The outer appearance of the Satpurush changes, but the divine virtues they exemplify through their inspiring lives remain pristine. The assembly highlighted some of these divine qualities of mahima, spiritual charisma and devotion evident in the lives of both Brahmaswarup Pramukh Swami Maharaj and Pragat Brahmaswarup Mahant Swami Maharaj. Through their speeches, Pujya Doctor Swami, Pujya Kothari Swami, Pujya Ishwarcharan Swami, Pujya Viveksagar Swami and other learned swamis elaborated upon these qualities to give the inspiring message of living a more meaningful life by offering devotion to Bhagwan, acquiring spiritual knowledge, and living a moral and spiritual life. 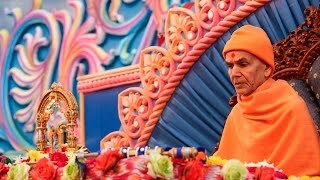 Interspersed between the speeches were engaging videos showing how these various virtues can be seen in the lives of both Brahmaswarup Pramukh Swami Maharaj and Pragat Brahmaswarup Mahant Swami Maharaj. On this occasion, His Holiness Mahant Swami Maharaj inaugurated several Swaminarayan Aksharpith publications: Vachanamrut app, ‘Gunatitanand Swami: Life & Work’ (English translation) and four new ebooks – ‘Prasangam 2009’, ‘Gems from Shikshapatri’, ‘Hindu Festivals’ and ‘Truth from Under a Tree’. Thereafter, HH Mahant Swami Maharaj blessed the assembly, emphasizing the necessity of unity and divinity for all to progress on the spiritual path. Then, HH Mahant Swami Maharaj performed the pujan and arti of Shri Harikrishna Maharaj and sprayed saffron-scented water on Thakorji. Finally, HH Mahant Swami Maharaj sat at the front of the stage to spray the devotees with the sanctified saffron-scented water. The devotees joyously departed from Sarangpur drenched by the divine shower of blessings from guruhari Mahant Swami Maharaj. Approximately 8,000 volunteers served in 30 different departments to ensure the efficient planning, preparation and execution of the celebration.